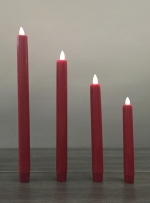 Fireless candles provide a lifelike flickering flame, an appearance of real burning candles without the risk and heat of lit flames. LED bulbs flicker in a similar way to a normal flame to create the same impression. They are safe to the touch and allow use over and over again without burning wax and replacing candles. 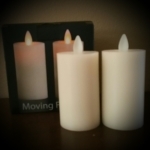 Made from 100% paraffin wax, they have no open flame, no hot wax, no smoke, and no soot. 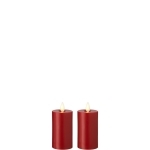 These candles are safe near children and pets. 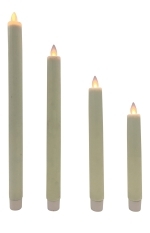 Our outdoor fireless candles are like no other battery-operated candle. An internal LED source shines through a prism and up to the flame tip. The flame moves creating dance-like movement that is eye-catching. And they fit your home, deck, patio, and poolside furnishings! 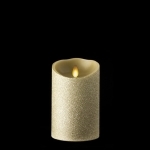 Fireless candles from Twigs Candles are beautiful! Displaying 1 through 80 of 80 products. Wax Pillar Flat Top With Timer Ivory 3.5" x 5"
Wax Pillar Flat Top With Timer Ivory 3.5" x 7"
Wax Pillar Flat Top With Timer Light Grey 3.5" x 5"
Wax Pillar Flat Top With Timer Light Grey 3.5" x 7"
Wax Pillar Flat Top With Timer Light Grey 3.5" x 9"
Wax Pillar Flat Top With Timer Taupe 3.5" x 5"
Wax Pillar Flat Top With Timer Taupe 3.5" x 7"
Wax Pillar Flat Top With Timer Taupe 3.5" x 9"
Outdoor Fireless Candle Ivory 3.5 X 7"
Outdoor Fireless Candle Ivory 3.5 X 9"
Chandelier Bulb 1" x 2.5"
Burlap Wrapped Fireless Candle 3.5" x 5"
Burlap Wrapped Fireless Candle 3.5" x 7"
Mercury Glass Fireless Candle (Gold) 3.5" x 8"
Mercury Glass Fireless Candle (Silver) 3.5" x 6"
Mercury Glass Fireless Candle (Silver) 3.5" x 8"
Glitter Black Wax Pillar Fireless Candle 3.5" x 5"
Glitter Black Wax Pillar Fireless Candle 3.5" x 7"
Glitter Orange Wax Pillar Fireless Candle 3.5" x 5"
Glitter Tiffany Wax Pillar Fireless Candle 3.5" x 5"